Amerian Congreso Buenos Aires, 3 star superior category, its located at only half a block from Callao Avenue and steps away from the National Congress House, in the traditional neighbor of Congreso. Its location presents short distance from and to the Obelisk. Avenue 9 de Julio. Avenue Corrientes and the most distinguished entertainment places. 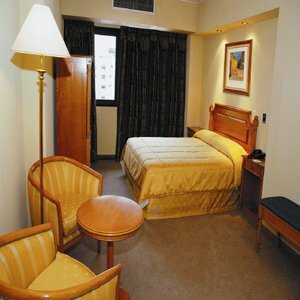 Amerian Congreso Buenos Aires has 90 rooms and offers all the services and comfort oriented to satisfy guests in their business or leisure activities. The double twin rooms were created to provide the necessary comfort to those passengers who travel for business or pleasure. They measure 28 square meters and have 2 beds 1.3 x 2 meters. They also have a small reception room with a comfortable sofa and a working table. The Marriage Double rooms were designed to provide the necessary accommodation for those passengers who travel for business or pleasure. They measure 28 square meters and have one bed of 1.7 x 2 meters which offers the exact comfort for the days rest. They also have a reception room with a sofa and a working table. The Junior Suite room was designed for more and distinguished comfort. They are 37 square meters and a double bed of 1.7 x 2 meters for your so waited relax at the end of the day. They also have a living room with comfortable sofas, a working table, kitchenette equipped with glass and silverware, microwave and minibar.